EstateSale.com has announced the winners of their fourth annual Excellence in Estate Sale Marketing Awards. The awards are based on the estate sale companies' listing views at the website throughout 2016. EstateSale.com gives out awards for the #1 Most Viewed Estate Sale Company in the US, The Top 50 Estate Sale Companies in the US, and the #1 Most Viewed Estate Sale Company in each of the qualifying states. In all, 86 awards were given out to 66 estate sale companies from 37 states. 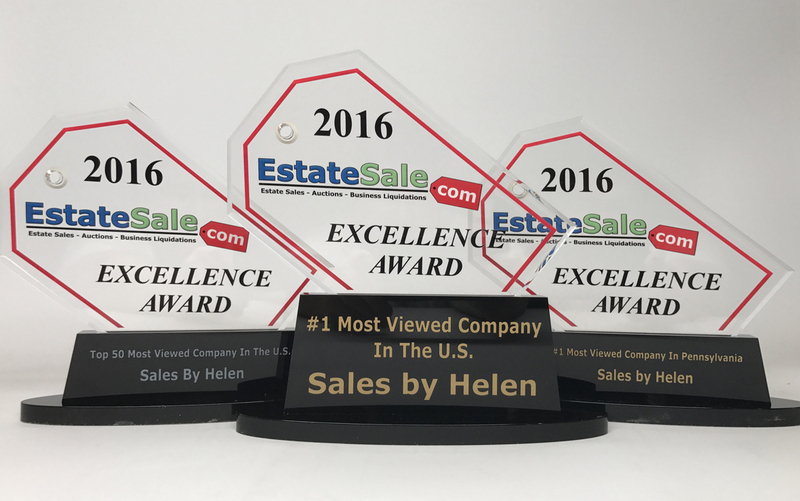 The award for the #1 Most Viewed Estate Sale Company in the US was won by Sales by Helen of Ardmore, PA. Sales by Helen has now won this award for the second consecutive year. Previous winners of this award were J&S Estate Sales of North Texas, and When Pigs Fly - Estate Sales & Auctions Dallas/Ft. Worth Metroplex & North Texas. Presley Estate Sales and Auctions, LLC. The Perfect Piece Estate Liquidators, Inc.
Florida - Blessed & Grateful Inc.
Kentucky - Reggie's Attic & Estate Management Co.
New Hampshire - Estate Sales by Jesod, LLC. These award winning companies provide an invaluable service to their communities. Clients will hire companies for various reasons; estate liquidation, divorce, downsizing, moving, and more. The companies use their marketing skills and knowledge of item values to help these clients maximize their return. EstateSale.com is a national estate sale website founded in 2011. Over 6,480 professional estate liquidators have signed up at the website to advertise their upcoming estate sales and auctions, including 1500 new companies in the last year alone. The EstateSale.com basic service is free for estate sale and auction companies, and allows them to post unlimited estate sales (41,915 last year) and upload unlimited photos (Over 3 million last year) for free. EstateSale.com is used by thousands of people each month who are looking to hire a professional company. The EstateSale.com lead generator matches as many as 1000 sellers each month with companies in their area.